The Istituto Poligrafico e Zecca dello Stato issued Italian Lira coins in 10 different denominations, including this 5 Italian Centesimi coin. They are part of the Italian Lira coins series. The Istituto Poligrafico e Zecca dello Stato started issuing these 0.05 Italian Lira coins in 1919. They were withdrawn from circulation in 1937. The centesimi is the subunit of the Italian Lira: 1 Lira is the equivalent of 100 centesimi. 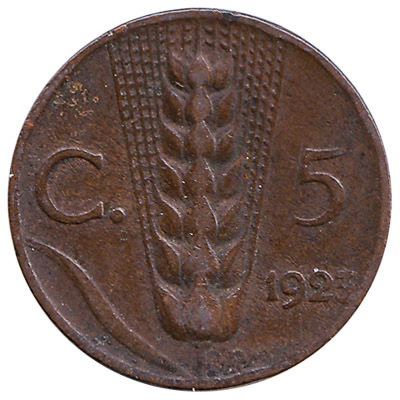 This copper coin of 5 centesimi has a value equivalent to 0.05 Italian Lire. It has virtually no value, and unless you have a few hundreds of these coins the payout will be less than a penny. On the 5 centesimi coin is the portrait of King Victor Emmanuel III of Italy and an ear of wheat. Repeat these steps for any other notes and coins you want to exchange. Complete checkout and get paid within 5 days of receiving your currencies. To exchange your 5 Italian Centesimi coin for cash: add it to your wallet now!